Before he became a professional linguist, Wilfred Whiteley was employed in anthropological research by the then Government of Tanganyika in the Southern Province of that Territory (1948-51). In 1949 he was requested to investigate the customary law on chiefly succession in the Njelu Ngoni chiefdom of Songea District, where dispute had arisen over the appointment of a new chief. In 1952-3 I was asked to continue and to widen those inquiries, both as part of a general anthropological survey and because a succession dispute had developed in the other Ngoni chiefdom in the same District. Whiteley had left a brief memorandum and a few notes which I was able to use as a starting- point. Some of the resulting data have been published elsewhere (Gulliver, 1954, 1955, and 1971). It is fitting, however, to return to those materials in memory of my old friend and colleague, and as a reminder of his sustained interest in social anthropology. A senior lieutenant of Zwangendaba, but not an agnatic kinsman, Zulu Njelu, and a lesser leader, Mbonani Mshope, together with the people under their command, broke away and migrated eastwards into southern Tanzania. Under their immediate successors two independent chiefdoms were finally established to the east of Lake Nyasa (Songea District) in about 1862. Each of these-Njelu and Mshope-was a predatory military group whose forces raided and plundered widely on all sides, rapidly increasing their size by the absorption of war-captives. At the close of the nineteenth century each chiefdom acceded to German colonial authority, but each continued, more or less, the established regime until they were defeated and devastated punitively as a result of partici- pation in the Maji Maji Rebellion, 1905-7. The two chiefdoms therefore existed and developed for some 50 years only before being forcibly brought within a colonial r6gime which compelled political subordination and modification and put an end to military enterprise.4 During that 50 years of warfare and expansion, and despite occasional tensions, the two chiefdoms remained friendly and in close touch and at least on one occasion they allied together (against an invading Hehe army, as described later). In each chiefdom broad status categories were based by birth on historical, ethnic criteria. In descending order these were : Gama (in Njelu) or Tavete (in Mshope), agnates of the great chief and of the same kibongo 'clan'5; Swazi, the agnatic descendants of original adherents of Zwangendaba from the northern Nguni area of south-eastern Africa; 'old Ngoni', followers and their agnatic descendants taken (by capture or voluntarily) into Zwangendaba's group during the northward migration through Mozambique, Rhodesia, Zambia, and south- western Tanzania; 'new Ngoni' (referred to as sutu 'conquered people'), persons and their descendants taken in warfare at the time of or following the establishment of the chiefdoms in the Songea area. These were not caste-like categories, however. Intermarriage occurred among the first three, and 'new Ngoni ' wives were taken by men of those first three. A few ' new Ngoni ' men took wives from higher categories towards the end of the century. Membership by birth in the higher categories did not necessarily prescribe military leadership, nor authority over ' new Ngoni ' as head of a segment, nor wealth. There were many royal agnates, Swazi, and ' old Ngoni' who never achieved much if any success; but with a single exception (a minor lieutenant in Mshope) all the principal leaders came from those categories. Such leaders were not in practice, however, ranked according to status by birth but principally by achievement in politico-military enterprise. Population figures for the nineteenth and early twentieth centuries are not, of course, available. By 1948 (the earliest fairly reliable figures), the Njelu chiefdom contained about 75,000 people of whom approximately 1,900 (2 6%) were of Gama or Swazi descent, and approximately 11,000 (c. 15%/) were of 'old Ngoni' descent. In Mshope the total population in 1948 was about 31,000 of whom approximately 3,500 (18%) were of Tavete, Swazi, or 'old Ngoni' origins. These proportions may be rough indications of the relative proportions at the end of the nineteenth century, for there is no evidence of later differential reproduction rates among these populations. Each great chief (nkosi) held office through agnatic descent from the chiefdom's founder. Each had a number of senior lieutenants (s. nduna) who were agnatic kin, Swazi, or 'old Ngoni'. Each nduna had his own lieutenants, and a great chief had lesser lieutenants (s. lidoda) who came from all status categories; and in some cases these men had their own lieutenants (s. mnunzana, but more often also referred to as lidoda). Each lieutenant headed a segment of the population within the wider segment headed by his immediate superior, on the ideal pattern of a segmentary state. A lieutenant was both the military leader and the civil authority over the people of his segment, but he was subordinate to the head of the superior, containing segment. Male war-captives were allocated to a segment in the idiom of kinship, becoming 'younger brother' or 'son' of the segment head or one of its members. Segments had therefore the image of patrilineal descent groups, but this was not emphasized outside of the political ideological context and real kinship rights and obligations were not postulated beyond cognatic and affinal relations. Neither were segments at all significant in connexion with marriage choice. Female captives were taken in marriage by the men, or their sons, to whom they were allocated. There is little indication that war-captives sought to escape from Ngoni country once they were brought there, though perhaps a very few did. Their homes were anything from 50 to 300 miles away, and the Ngoni chiefdoms early became surrounded by a ring of uninhabited country (except for the Matengo mountains to the west of Njelu) which took more than a day's walk to cross at the real risk of recapture and death. In the 1950's I talked with many of the later captives (then elderly people) : the consensus was that they did not know how to reach their distant homelands, and that in any case they assumed (probably rightly) that their old villages had been destroyed and that their kin were killed, captured, or refugees in unknown areas. War-captives were given security in their new affiliations, the prestige of becoming 'Ngoni', and for males the opportunity of participating in and profiting from Ngoni raiding. They shared in what seems to have been the euphoric ethos of Ngoni success and wealth. They obtained land to cultivate, new 'kin' with whom to cooperate, and a leader to follow. Segments could increase or decrease relatively in size, and they and their heads changed in status accordingly, as new war-captives were allocated to them. Further segments could be created under new lieutenants. The headship of a segment could be gained by agnatic succession, but alternatively it could be taken over by the ambitious head of a subordinate segment who had demon- strated military skill, gathered many followers, and won the approval of the superordinate leader. A lieutenant with his segment was sometimes reallocated to another superior segment, and occasionally he could achieve roughly equal status with his former superior at the decision of their joint superior in the hierarchy. Success in predatory warfare-skill in leadership, captives and booty taken-was the main key to lieutenants' rewards, to their relative status in the hierarchy and degree of autonomy, and to the changing position of their seg- ments in the total structure of the chiefdom. Because of rapid expansion and a marked achievement ethic, there was considerable fluidity in the structure: relative stability had not emerged in either chiefdom by the end of the period. Before the two chiefdoms became finally located in the Songea area the original leaders of each-Zulu and Mbonani-had both died. 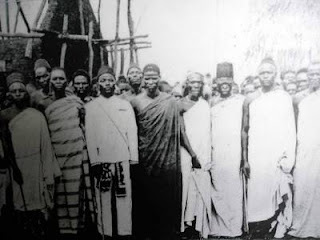 Their successors came to office as the end was made to the long migration and after the defeat and expulsion of an earlier Ngoni group in that area.6 Thereafter, successive great chiefs had in practice, deliberately or not, to deal with certain common factors: the position of leadership, from great chief to smallest segment head, affording rights and authority over people rather than over particular territory and non-human resources; a rapidly growing population and the need to allocate and deal with subordinate politico-military responsibility; the allocation of the spoils of warfare--human captives, cattle, foodstuffs, material goods; the fact that success by subordinates varied and changed, and so therefore did rewards and relative status; the potential or actual threats as subordinates became powerful enough to secede with their own segments; conflict over succession to the chiefship, and its aftermath; increasing detachment from the Nguni cultural tradition (of south-eastern Africa) and increasing cultural heterogeneity and innovation with a growing majority of 'new Ngoni' from east-central Africa; a poor natural environment in which shifting cultivation required periodic moves as soil fertility and locally available land became exhausted; the increasing impingement towards the end of the century by Coastal slave-traders, reconnoitring missionaries, and German colonial forces. As a result of strategies adopted, and other factors internal to each chiefdom separately, despite many structural and cultural similarities by the end of the century the two chiefdoms had become distinguished in a major organizational feature: the degree of centralization. The Mshope chiefdom had become a highly centralized unit, with no major nduna (chief's lieutenant), with virtually all segment heads (but not all segment members) living next to the chief's capital village, and with the chief himself as the civil authority and the dominant war-leader both strategically and in the field. By contrast, in Njelu chiefdom there was a marked degree of decentralization: there were ten manduna (chiefs, or senior lieutenants of the great chief) exercising autonomous authority over their major segments, living in villages comprising their own segment members geographically quite separate from the great chief's capital village. These chiefs initiated the principal military expeditions under their own direction in the field, whilst the great chief seldom if ever led a raiding force. The purpose of this paper is briefly to examine analytically the factors and processes which produced this significantly different development.7 For convenience, the evolution of each chiefdom is dealt with separately, beginning with Njelu for which I and almost all other sources have the richer and more reliable data. The founder of this chiefdom, Zulu son of Njelu Gama, was an acknowledged senior lieutenant of Zwangendaba8 and head of a well-established segment of the original Ngoni migrant group. At the time of his secession from that group (c. 1850) he already had five senior lieutenants: Mawaso (his half-brother), Mpofu (his patrilateral cousin), Chombera (Swazi), and two 'old Ngoni', Chikuse (Nyami) and Songea (Kalanga). Chikuse was recognized as his senior- most lieutenant and was the holder of war medicines. There were other, lesser lieutenants also, and the group had already gained a degree of internal segmentation. After nearly 10 years of further migration and raiding, during which time the group increased in numbers, Zulu died. At about the same time or soon after Zulu's cousin died, and his half-brother together with Zulu's eldest son and two other young adult sons left the group to rejoin the Mbelwa segment of Ngoni, by then established in northern Malawi. Whether they were driven out as a result of political conflict (or for other reasons) is not known; but the effect was that two senior royal9 lieutenants, Zulu's probable heir, and two potential royal lieutenants were removed from the scene. The three remaining senior lieutenants (none of whom was an agnate of Zulu) agreed to choose the remaining eldest son of Zulu, Hawayi, as successor. They passed over the remaining seniormost son, Mhalule (of the seniormost house of Zulu), because of his relative youth and inexperience, although Hawayi was little better qualified in practice. There was little or no conflict over this since the three senior lieutenants were so dominant and the senior son was in no position to recruit support for his own claim. It was significant, however, that the choice was made by those three, non-royal heads of major segments of the young chiefdom. The four senior lieutenants seem to have wished to maintain the unity of the chiefdom and were content to give allegiance to the new great chief whom they had selected. Hawayi12 was in a weak position and necessarily had to concede considerable freedom to his senior lieutenants. He appears to have been at least a competent co-ordinator as the new chiefdom embarked on persistent raiding of the surrounding peoples in southern Tanzania and northern Mozambique. Several military expeditions were made by the 'chief's army' (i.e. a single fighting force drawn from all segments of the chiefdom), though it is unclear whether he himself led such an army. Certainly expeditions were also recruited from the major segments separately, and led by each senior lieutenant. These latter increased in frequency whilst the idea of a' chief's army' declined and seems to have disappeared before the end of Hawayi's reign in about 1874. This is suggested not only by accounts of raiding forces but also by the com- monly acknowledged fact that during this reign an age-regiment (the Ngoni military unit) no longer comprised all the coeval young men of the whole chiefdom. Thereafter, although new age-regiment names applied throughout the chiefdom, fighting units became effectively limited to coevals within a major segment under the segment head. At about this time the senior lieutenants came to acquire the title of nduna (to be glossed as 'chief' in reference to Njelu), although that term could also be applied to lesser lieutenants as a mark of prestige and compliment. During most of Hawayi's reign the chiefdom comprised a consolidated residential unit, with the great chief's village at the centre and villages of the major segments clustering around. As local land was exhausted in agriculture the whole chiefdom shifted to a new location where fresh land was available- i.e. after about half a dozen years. But by the end of the reign the growth of population through the assimilation of war-captives was such that it scarcely remained possible to continue the concentration which had originated in the earlier requirements of the smaller, migratory war group. The local miombo woodland soils are poor, yielding crops for only about three successive seasons and requiring 20 or more years of subsequent natural fallow (Gulliver, 1971, 40-3). It is possible that the chiefs took the opportunity to re-emphasize their autonomy under these circumstances; but in any case the new pattern that began to emerge was an expression of that autonomy and strengthened it further. From that time the successive residential locations of the major segments and of the great chief's village13 show that the consolidated unit was no longer maintained. Instead each chief and his major segment focused in a general area relative to but at some distance from the great chief's village (up to a day's walk away). The great chief's village and satellites, and the various chiefs' villages and their satellites, thereafter shifted independently according to land needs as assessed by the chiefs themselves with their own lieutenants. First-fruits ceremonies seem to have ceased for the whole chiefdom at about the same time. The new pattern was that the major segments based on the two remaining houses of Zulu (Maposeni and Mpitimbi), together with chief13 The sites of the main villages were fairly well remembered in the middle of the twentieth century. Magagura's major segment, remained more or less in the central and north- central areas. Other major segments were disposed roughly as follows: north- west-chief Chombera; west--chief Putire; south-west-chief Chikuse; east and south-east--chief Songea. After this geographical separation of the major segments from the great chief's capital, it is reported that the chiefs regularly visited the capital and the great chief occasionally visited their villages. But unlike the practice in some African states, a chief did not keep an official residence nor a representative at the capital. As a result there was diminished co-ordination of military activities and administration after that time. The death of Hawayi (c. 1874) raised no special problem. The chiefs agreed to the succession of his younger brother, Mhalule. He had previously been chief of the major segment based on his father's (Zulu) house I; and although he became the great chief, in many ways he continued as head of an autonomous major segment, and perhaps not much more than primus inter pares. Zulu's house II (formerly headed by great chief Hawayi) was continued as a major segment under Hawayi's younger half-brother, Mlamilo. The general pattern now was of seven largely autonomous segments, residentially separate, each shifting locally and independently in response to land needs. Raiding parties originated mainly from each segment, though two or more could loosely ally together in major expeditions. Mhalule seems not to have led a war party in the field, though he and his capital village served still as a useful focus for co- operative consultation and co-ordination. Retrospective reports from mid- twentieth-century informants agree that a proportion of war-captives and booty was given to the great chief on the return of raiding expeditions, but that the main allocation of these spoils of war was controlled by the chief concerned, and not by the great chief. This meant that the head of each major segment was able to control the rewards for service among his subordinates and dependants; and in particular he could control the relative growth of sub-segments and the creation of new ones, and the relative status of his lieutenants. War-captives were, of course, the principal source of the growth of segments at each level. Thus the great chief had little patronage to dispense outside of his own major segment. Common memory has it that the chiefs were not much concerned with the internal civil administration of their segments, leaving it to their subordinates (heads of sub-segments) to take care of affairs among their dependants. These subordinates were able to mount minor raids and so, with war-captives and booty, to seek to achieve the prestige of military success. However, the potential decentralization within a major segment was restricted as the chiefs continued to initiate and lead the more important military expeditions, retaining the power to allocate this main source of war-captives. This meant that whilst there was competition between sub-segment heads (lieutenants) for military success, prestige, and war booty, there was seldom direct confrontation between these men and their superior. In effect (and perhaps through deliberate intent) there was a policy of divide and rule within a major segment-a policy which was not practised at the chiefdom level because (as I have shown summarily) the great chief was in too weak a position. There are no reports of overt competition between the chiefs themselves. The reasons for this may lie in the territorial segregation and autonomous military competence of each chief. But in addition a pertinent factor must have been that this was a period of uninterrupted military success and population expansion. The peoples within reach of Nielu Ngoni raiding-east as far as the Indian Ocean (350 miles) and south deep into Miozambique-offered little resistance. They lived mainly in acephalous societies without the means of organizing concerted defence, nor were they culturally oriented to military endeavour. Each Njelu chief appears to have been absorbed in planning and leading predatory expeditions, celebrating successes on the return home, and distributing captives and booty. Each chief tended to raid outwards from his own location in the chiefdom, so that each had roughly his own sector of interest. Competition in the field seldom or never occurred. In brief, there seems to have been neither need nor desire to compete for spoils because so much was readily available for all. Meanwhile the great chief's focal co-ordination was adequate to maintain sufficient but loose unity. During Mhalule's reign (c. 1874-89) there was, however, something of a counteraction to decentralization. Mhalule himself (unlike his brother previously) was a mature man at the time of his succession and experienced in military command as head of a major segment during the preceding reign. He seems to have been ambitious to emulate his father's (Zulu) preeminence, though his opportunities were small. It is reported that he made a practice of holding large feasts frequently at his capital village to which came the chiefs and their followers. At least the idea of his capital as the focus of the whole chiefdom was kept alive; and he acquired a useful reputation for generosity and hospitality by this expenditure of the cattle and other booty he obtained from his subordinates' raiding. During Mhalule's reign (but the dates are unclear) contacts were made with the Mbelwa Ngoni chiefdom beyond Lake Malawi. This chiefdom had developed from the segment of Zwangendaba's group from which the Zulu Njelu group had seceded; and it was to this chiefdom that three of Zulu's sons had gone at the time of his death (see above, p. 86). Mhalule sent messages inviting his brothers to return. The eldest, Gwaselepasi, made a visit but soon returned to Mbelwa. The two younger half-brothers, Fusi and Mkuso, came and decided to stay. They became chiefs of major segments based on the two reconstituted junior houses of Zulu. Apparently at least one reason behind Mhalule's action was to gain new lieutenants who might be expected to give direct loyalty to him as great chief and senior brother, in contrast to the other chiefs. It was an attempt to reinforce his central position; but the new major segments were in fact created at the expense of reducing the size of the existing major segment based on house II.15 Moreover, both Fusi and Mkuso seem to have modelled their policies on those of the other chiefs and to have sought increasing autonomy as their own raiding was successful and the size of their segments grew. Mhalule's strategy was not, therefore, particularly effective. Indeed, by creating a potential royal faction as against a non-royal faction16 he might have succeeded only in splitting his chiefdom irrevocably-although the occasion for such confrontation did not arise. To further his policy, Mhalule attempted the traditional Nguni practice of allocating his wives to reside at the villages of his senior lieutenants. There they could represent the great chief's authority, act as channels of communication, and perhaps provide a justifiable reason for his regular visits to the headquarters of each major segment. This stratagem was no more successful. Chief Songea refused to accept a wife of the great chief in his village, whilst other chiefs who did were able to nullify the intended effects. Towards the end of Mhalule's reign, Zamchaya (eldest son of Zulu's eldest son) came from the Mbelwa chiefdom, and was made lieutenant over a lesser segment within house I. At the death of Mhalule he claimed the chiefship, with some support of the royal chiefs. The leading non-royal chiefs agreed, however, in supporting the seniormost surviving son of Zulu, Mlamilo of house II. Their reasons are not known. But Mlamilo was at least middle-aged by this time and was more or less chronically ill and enfeebled. Unlike his predecessor, he did little to strengthen centralized authority in the chiefdom. Both non-royal and royal chiefs continued to increase the size and to maintain the autonomy of their segments. By now chief Songea was not only head of the largest segment (perhaps almost a quarter of the total population) but he was acknowledged as the most influential leader in the chiefdom. He seems to have led meetings and discussions with both Coastal slave-traders and the early German mission- aries and colonial officers.17 So impressed were the German authorities that they called their new administrative district and its headquarters by his name. At the end of the century the chiefdom was still expanding until the Germans put an end to raiding. At the death of Mlamilo in 1899 both Fusi and Mkuso (surviving sons of Zulu) made claims to the chiefship, as also did Mputa, senior- most grandson of Zulu, now come from Mbelwa's chiefdom. By now a German military-administrative base had been established at the new Songea township, and therefore German influence may have been important. Mlamilo seems to have been recognized only as one' sultani ' along with the chiefs who were given the same title. Mputa became 'sultani' of the Maposeni (house I) segment without the full support of the other chiefs, and he was seen by Ngoni and Germans alike as little more than primus inter pares. It is significant, nevertheless, that at the outbreak of the Maji Maji Rebellion in the region in 1905 Mputa's village was the central rallying point for the Njelu chiefdom. Decentralization, though well advanced, had not therefore reached the point of culminating disintegration of the chiefdom into its constituent parts. As a result of the unsuccessful rebellion, great chief Mputa, chief Songea, and other Njelu leaders were executed, whilst others and their dependants fled in all directions. After some two years of punitive measures the Germans appointed or recognized new ' sultani ' (junior agnates of former office-holders) over each segment. Strict military control and a nascent civil administration were maintained thereafter. The Njelu chiefdom was later reconstituted under indirect rule policy by the British colonial authorities, but by then both external and internal political conditions had radically changed. The founder of this chiefdom, Mbonani son of Mshope Tavete, apparently was not an important lieutenant of Zwangendaba, nor did he play a significant part in the northward migration of the original Ngoni group.18 At the time of his secession from that group, in association with Zulu Njelu, it is most probable that he led only a small group of followers (possibly much smaller than that of Zulu). His only senior lieutenant was his half-brother, Mnukwa. It is possible that other, lesser lieutenants emerged only during the following decade before the final settlement in the Songea area; but in any case none had become well established enough by that time to head a major segment. At the death of Mbonani the succession was straightforward. His eldest son, Chipeta, was in his early thirties19 and had acquired experience and prestige as a war leader. Other sons of Mbonani were still youths and offered no rivalry; and his paternal uncle, making no claim to be more than head of a major segment, supported the new chief. Thus the chiefdom, newly settled about 20 miles north-east of the modern Songea town, was a small, compact unit with little internal division. Chipeta was firmly in control, with only minor lieutenants of Swazi or 'old Ngoni' origin; and at least some of his younger brothers died before they could become important segment leaders. Chipeta's coeval, patrilateral cousin, Mpepo, seems to have remained clearly subordinate to the latter's father, Mnukwa. The size of the chiefdom continued to grow as a result of successful raiding. Chipeta himself both initiated war parties and led them in the field. Age- regiments comprised coeval young men of the whole chiefdom. The allocation of war-captives and booty was strictly controlled by Chipeta, which meant, of course, that he was able to control rewards and the relative status of subordinate leaders and their segments. His policy appears to have been to develop a relatively large number of small segments headed by lesser lieutenants. This may have been a deliberate intent to restrain potential competition for authority, but in any case there is no evidence of any senior lieutenants (except the ageing Mnukwa) in this reign, nor of any threat to his supremacy. The succession was further troubled by the concurrent death of Mnukwa and the claim of his son, Mpepo, to a large share in the wealth (principally cattle) of Chipeta. This seems not to have been an indirect claim to the chiefship, and most twentieth-century Ngoni agree that office and wealth are separable inheritances. Mpepo's claim to a share of inheritance of property may therefore have been quite a legitimate one, but it was denied by Chabruma. In dis- satisfaction Mpepo seceded with his (formerly his father's) segment and moved northwards some 80 miles into what is now southern Mahenge. Thus the chief's major lieutenant and a potential rival for power, left the chiefdom. About this time (c. 1881) the second Hehe invasion occurred. Although it is reasonably clear that the Ngoni offensive against it was mounted by great chief Mhalule of Njelu, yet Chabruma at a minimum shared in the success of the enforced withdrawal of the Hehe, and certainly he led the Mshope army as its single principal commander. A year or two after this, Chabruma gave sanctuary to a small group led by Sakamaganga, second son of a Bena chief in southern Mahenge. Mpepo now allied with Kiwanga (elder brother of Sakamaganga and his legitimate chief) and the two led an invasion force into Mshope (c. 1885). It was driven off without great difficulty by a united force led by Chabruma. Both in the second Hehe invasion and in that of the Mpepo group, Palangu supported his brother. Fairly obviously, Chabruma had demonstrated his able leadership in warfare and his authority over the whole chiefdom. As a result of the Mpepo secession and possibly some minor secessions to Njelu, the chiefdom was reduced in size, whilst confidence had been severely shaken by the Hehe devastation. Chabruma as the new chief took the praise for what was a successful reconstruction and defence. Thus his power was such that he was able to con- tinue his father's authoritarian policy. Mnukwa's former segment had gone; and of the two houses of Chipeta, the first at this time contained only young sons and seems not to have formed the basis of a major segment of the chiefdom. In the second house, that of Chabruma himself, only Palangu was an adult man; and Chabruma permitted him to be no more than a minor lieutenant. In effect the chiefdom consisted of a single major segment (comparable to a Njelu major segment) based on house II of former chief Chipeta, with Chabruma at its head. Chabruma followed Chipeta's policy in insisting that all of his lieutenants21 lived immediately adjacent to the chief's capital village. At first, and into Chabruma's reign, the whole chiefdom moved as a unit in the periodic requirement to obtain access to new woodland in the shifting cultivation regime. Gradually, however, as the population began to increase again with the renewal of marauding warfare, the commoner population began to spread out and to drift eastwards and north-eastwards into unoccupied country, seeking fresh agricultural land. Chabruma permitted this, tacitly or not, whilst at the same time he continued to insist that his lieutenants reside next to his own capital village. Thus gradually most (or even all) of the lieutenants came to be residen- tially separated from the segments of people which they headed. That is, substantial numbers of Mshope commoners came to live apart from their leaders; and this was tolerated so long as they continued to render tribute and to supply men for raiding parties. By the end of the century, the Mshope population had become fairly thinly spread (at something like 10 persons per square mile) over an area extending up to 40 miles from the chief's capital. This development was paralleled by Chabruma's policy of maintaining client populations at a distance from his capital. Thus there was a Bena group in the Mahenje area, some 40 miles north-north-west, which, after conquest, was allowed to remain on its lands whilst sending tribute and army recruits regularly to the chief. Similarly, Sakamaganga's group22 became a client population to the north in southern Mahenge after the Mpepo invasion. The reasons for this policy are not known. It is difficult to imagine such a development in the Njelu chiefdom, and it can only be suggested that Chabruma placed his principal strategy on keeping his lieutenants resident at the centre, under strict control, using them primarily as subordinate war-leaders and tribute collectors. Some time during the early 1890's Palangu sought to gain the position of something like sub-chief over those newly occupied areas to the east and north- east. Presumably he wished to create a new major segment in the novel circum- stances, with himself as new senior lieutenant or nduna . Chabruma rejected this idea, reportedly because Palangu was still claiming himself to be the rightful successor to Chipeta. No doubt Chabruma feared a possible secession by Palangu if the latter were to gain local autonomy. But also Chabruma seems to have been adamant in refusing to allocate any considerable degree of authority and responsibility to any lieutenant; and at least for the time being the out- ward drift of the commoner population did not raise too serious problems in recruiting adequate war parties for continued raiding. Like great chief Mhalule, Chabruma followed a policy of frequent feasting, with much slaughter of cattle gained in raiding, attended by his subordinates, by which he acquired a reputation for hospitality and generosity. The chief's younger brothers and most other lieutenants did not support Palangu, nor did they claim autonomy for themselves. It may be pertinent to Chabruma's autocratic and centralized regime to note that, in some contrast with Njelu, he failed to appreciate the significance of new forces impinging on his chiefdom towards the end of the century. He remained isolationist, rejecting approaches by Coastal slave-traders, European mission- aries, and, eventually, German colonial officers. Ultimately, whilst treating with the Germans at the end of the century, he sent (or led ?) a major raiding party into the Kilwa hinterland (south-central Coastal region); and as a result a German party occupied his chiefdom by force, exacting reparations in cattle and food (Ebner, 1959, 158). When the Germans established colonial hegemony in the region at the turn of the century they did not recognize Chabruma's authority over either the eastern or the northern areas. He was recognized as ' sultani ' over the central part of his chiefdom only, and an akida (appointed official from the Coast) was placed in those other two parts. Whatever the reason for this German policy, it is clear that in both eastern and northern areas there were considerable populations among whom no Ngoni authority was resident. Chabruma's objections to the Germans were ignored, and this may have been a major reason why he enthusiastically embraced the mystical power and the opportunity for rebellion offered by Maji Maji in 1905. In defeat Chabruma fled to Portuguese territory where he later died. In 1907 his eldest son was apointed as 'sultani' over the central area, under the direct authority of the German colonial government. Only much later under British indirect rule policy was Palangu recognized as sub-chief (nduna) of the Mbunga (north-eastern) area; and Ngoni sub-chiefs were appointed to the Likuyu (eastern) and Mahenje (northern) areas in 1930 and 1939 respectively, although still no Ngoni (i.e. Swazi or 'old Ngoni') resided there. The two Ngoni chiefdoms were subject to colonial over-rule for more than half a century after the close of the ' traditional era' in 1905. As a result of the ideology and practical exigencies of colonial administration within Tanganyika Territory, the structure of each chiefdom was given a semi-bureaucratic formalism which, deliberately or not, significantly modified and rigidified the earlier systems. Mid-twentieth-century Ngoni perceptions of the past must have been affected by this experience, as well as by the passage of time which encouraged some idealization of earlier conditions. Nevertheless, retrospective Ngoni accounts strongly suggest that the ideological model of the segmentary state persisted in both chiefdoms during the second half of the nineteenth century.23 In this model, the great chief ' owned' the whole chiefdom and its people, and was the ultimate authority by virtue of descent from the founding leader. The chiefdom was divided into major segments of the population (not of territory), each under a senior lieutenant of the great chief. Each major segment was subdivided into lesser segments, and these again subdivided, with each segment under a lieutenant of the head of the superior, encapsulating segment. A superficial view might thus summarily describe the politico-military structure, but this would largely ignore the evolving operational system in each chiefdom. The contrasting political evolution in the two chiefdoms has been implicit in the foregoing accounts in this paper, brief though they are and unavoidably lacking reliable data on some crucial points. Clearly the two did not in fact begin at the same point: decentralization and centralization were already present in early Njelu and Mshope respectively. That such a character should persist and develop further in each case was not necessarily inevitable, particu- larly in view of the prevailing ideology which fitted neither case at all well. Yet it did persist as a result of a variety of factors--political, organizational, successional, economic, demographic, and military. By the end of the century the Njelu chiefdom was in effect a confederation of the 10 major segments, each under its autonomous chief. The great chief, reduced almost to a symbol of ideal unity, was virtually but one such chief and not the most powerful in practice. In the Mshope chiefdom there were in effect neither major segments nor autonomous chiefs. There the great chief had autocratic, centralized authority over lesser lieutenants who had quite limited power over small segments. In summary, the more significant historical factors were these. The Njelu chiefdom began as a larger, well-established group already internally differen- tiated, with major segments under experienced royal and non-royal lieutenants. As a result of death and defection of royal leaders, three non-royal lieutenants were left in power after the death of the group's founder. They were able to choose and impose their power over the successor who was (and inevitably) a rather inexperienced son of the founder; and they could avoid subordination to the two remaining royal houses of the founder headed by junior sons. The chiefdom enjoyed more or less uninterrupted success in predatory warfare and expansion of population. With the prevalent poor soils and shifting cultivation it became necessary for the chiefdom to expand geographically and it was most practicable for each major segment to arrange its own periodic moves to fresh woodland within its own separate area. This avoided competition for land and, of course, it well suited the desired autonomy of major segment heads (chiefs). There was marked absence of concern for civil administration which was largely relegated to heads of minimal segments: thus no administrative hierarchy developed. Prestige, status, and power depended on military achievement, and here the chiefs were able effectively to control both fighting units and the distribution of captives and booty. A policy aimed at centralization by the great chief around 1880 was scarcely successful even though it was reinforced by his competent leadership against the Hehe incursion, and it was nullified by new royal lieutenants who gave him little support but rather sought an autonomy comparable to that of the older non-royal chiefs. In the 1890's an elderly, chronically sick great chief was unable to exert much influence, and his position was partly undermined by the growing rivalry of his elder brother's son. Thelatter eventually succeeded as great chief, but he was little more than primus inter pares. 2 Barnes, 1954, is a good source for references. 3 For convenience throughout this paper the names of modern African countries and places are used for reference. 4 The chiefdoms persisted until the abolition of all the chiefships in independent Tanganyika. 5 Presumably from the Nguni word isibongo ' praise-name '. 6 This was the Maseko Ngoni group which later settled in southern Malawi. It was not part of Zwangendaba's group and had reached the Songea area separately. Cf. Read, 1936 and 1956. 7 This analysis is based on data which I obtained in field research in 1952-4, together with materials gathered by earlier inquirers. The more useful sources on the Songea Ngoni are: Prince, 1894; Fullerborn, 1906; Hatchell, 1935; Gulliver, 1954 and 1955; Ebner, 1959. A number of missionaries, travellers, and early colonial officers visited or approached the Songea area during the second half of the nineteenth century and, although leaving rather little in the way of hard data, they have been useful in the establishment of a fairly dependable chronology. 8 He is referred to in the literature on central Africa Ngoni: e.g. Lancaster, 1937, 70; Barnes, 1954, p. 123, n. VOL. XXXVII. PART 1. 9 The term 'royal' is used to denote members of Zulu's patrilineage, i.e. the Gama kibongo. 10 See p. 84, n. 6. 11 Their remnants became parts of house II, but were later to be revived as separate segments. See p. 90. 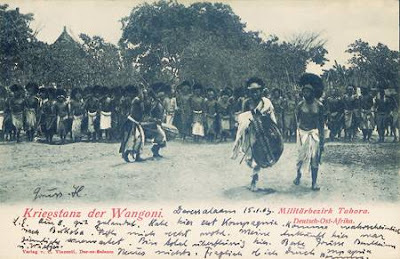 14 The rising Hehe state, some 200 miles to the north of Songea, had the only military force within hundreds of miles capable of offering any real threat to the Ngoni chiefdoms before the arrival of the Germans. No other external attack was made on either chiefdom during the period under review. 15 The rumps of houses III and IV had been taken into house II after the death of Zulu and the departure of his sons to Mbelwa in about 1860. 17 Fullerborn wrote: 'When I saw Songea in 1897, he was a sickly old man, but nevertheless he knew with unscrupulous energy how to get his orders obeyed promptly. At the meeting of chiefs which we had called, he was the speaker on behalf of the other chiefs. At times whilst he was speaking his bent body rose and his eyes sparkled so that his opponents trembled. He was a born ruler' (quoted in Ebner, 1959, 159). 18 Mbonani is nowhere mentioned in the plentiful literature on central African Ngoni. One story current among some of his descendants is that he led a separate migrant band northwards from the Swazi homeland, and only linked up with Zwangendaba's group shortly after the latter's death (Ebner, 1959, 66). There is no supporting evidence for this. 19 He was reported, by several of his descendants, to have been born a year or two before the Ngoni crossing of the Zambesi river in 1835. 20 This was on his own admission in a written autobiography taken from his dictation many years later when he was an old man, of which I have a copy in my files. This submission to Chabruma did not prevent him making renewed claims later on, although he never actively sought to contest his brother's power. 21 It is possible that none had the clear title of ndana (comparable to Njelu) and that all were referred to as lidoda (lesser lieutenant). The data are not clear. 24 As this article was about to go to press, I was informed that a Ph.D thesis by P. M. Redmond, A political history of the Songea Ngoni, from the mid nineteenth century to the rise of the Tanganyicka National Union, was accepted by the University of London in 1972. I was unable to consult this. Barnes, J. A. 1954. Politics in a changing society : a political history of the Fort Jameson Ngoni. Manchester: Manchester University Press. Ebner, F. E. 1959. History of the Wangoni. Peramiho, Tanganyika: Peramiho Mission Press. Fullerborn, F. 1906. Das Deutsche Njasa- und Ruwuma-Gebiet, Land und Leute, nebst Bemerk- ungen iber die Schire-Lander. Berlin: Reimer. Gulliver, P. H. 1954. Administrative survey of the Ngoni and Ndendeuli of Songea District. Tanganyika : Provincial Administration. Gulliver, P. H. 1955. ' A history of the Songea Ngoni ', Tanganyika Notes and Records, 41, 16-30. Gulliver, P. H. 1971. Neighbours and networks. Berkeley and London: University of California Press. Hatchell G. W. 1935. ' The Angoni of Tanganyika Territory ', Man, xxxv, 73, pp. 69-71. Lancaster, D. G. 1937. ' Tentative chronology of the Ngoni, genealogy of their chiefs, and notes ', Journal of the Royal Anthropological Institute, LXVII, 1, 77-90. Prince, D. 1894. ' Geschichte der Magwangara nach Erzahlung des Arabers Raschid bin Masaud und des Fussi, Bruders des vor drei Jahren verstorbenen sultans des Magwangara Mharuli ', Mitteilungen von Forsch ungsreisenden und Gelehrten aus den Deutschen Schutzgebieten, vII, 4, 213-24. Read, M. H. 1936. ' Tradition and prestige among the Ngoni ', Africa, Ix, 4, 453-84. Read, M. H. 1956. The Ngoni of Nyasaland. London: Oxford University Press.